How We Eat with Our Eyes and Think with Our Stomach: A Belgian chocolate cake topped with a velvety homemade mouse catches your eye on the menu. The next thing you know, you’ve ordered it – despite the hefty price. But do you know why? Through over 40 compelling questions, this book explores how our eating decisions tread the line between conscious and subconscious and enables us to be more intelligent about food. 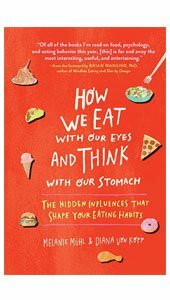 With expert insights that draw from psychology, neuroscience, popular culture and more, learn to see the innumerable influences behind your diet and cravings – from the size and colour of your plate, to the placement of products in a supermarket, to the order in which you sit when out with friends. And the chocolate cake? Would you believe research shows that regional descriptions (Belgian!) and emotive, sensory language (homemade! Velvety!) subtly affect your appetite? Know what and why you eat, when and how you do – before you next sit down to dine.